Hurricane Issac greets us once we got home! Whew, since returning from Africa and trying to get the blogs input, who would have thought that we would would soon be greeted by a very wet hurricane in Louisiana. Talk about contrasts! 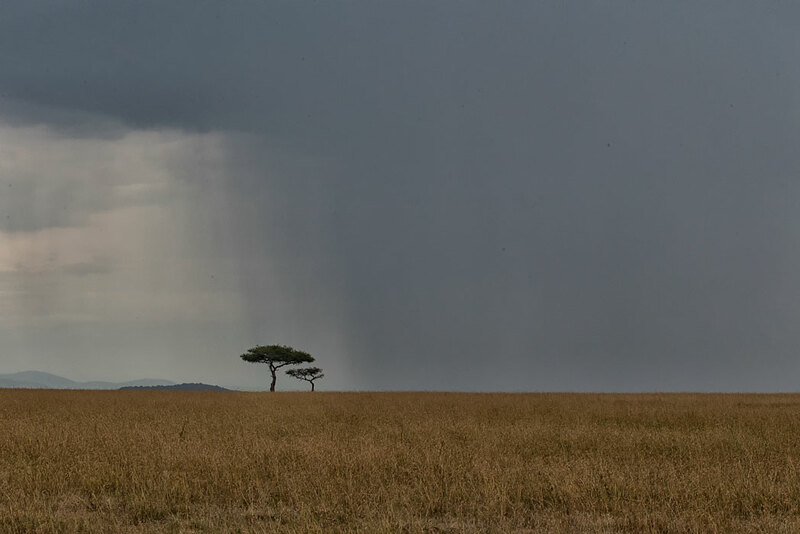 From the dry season in the Serengeti to a hurricane whose eye passed right over our home. The hurricane was minimal from a wind standpoint-but from a rain standpoint, Holy cow! The storm moved so slowly dropping 15-20 inches of rain in a very short period of time. While our home was unscathed, others were not so lucky. The route of the storm for many proved devastating from a flooding standpoint. Areas like my parent’s second home flooded for the very first time in over 35 years. Thus, our time has been better focused on helping others with their clean up. That effort is progressing but those flooded may face months of getting their property restored. In any case, now is the first time in many days that, I have been able to refocus on the blog! Ironic that Day 6 afternoon was the only day we got wet in Africa! 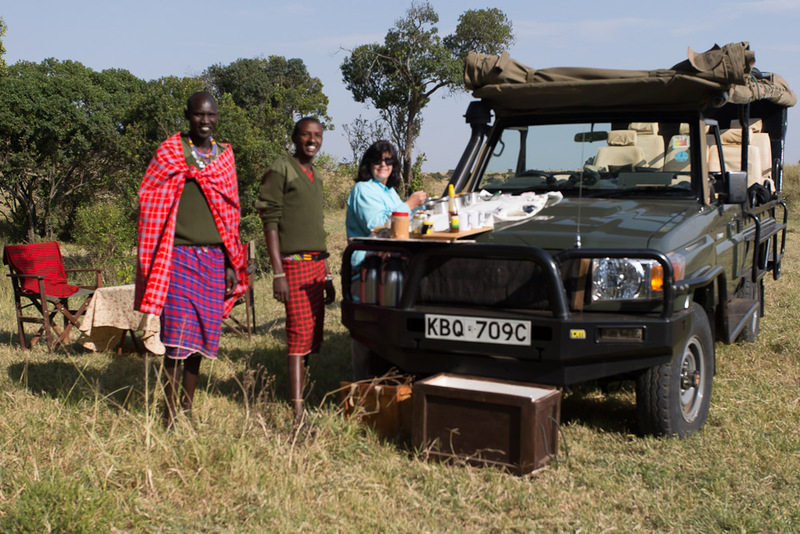 Rain can be seen off in the distance, but for now we are wrapping up a wonderful bush breakfast with Dennis (our driver) and Dominick (our guide). Both men are Swahili and would dress in traditional garb. Each had an amazing personality to go along with superb guiding and spotting skills. And special thanks to Alex Walker and Billy Jones for allowing them to guide us not only for this camp but our next stop as well. It is special to spend so much time with such wonderful African people. You cannot help but be amazed at their flawless English, big smiles and their life stories. So many tourists come to Africa and rush around from camp to camp and never get the chance to actually build new friendships and learn of a different culture. We can say first hand- slow down and enjoy the people as much as the wildlife and scenery-for they are as much a part of the story! 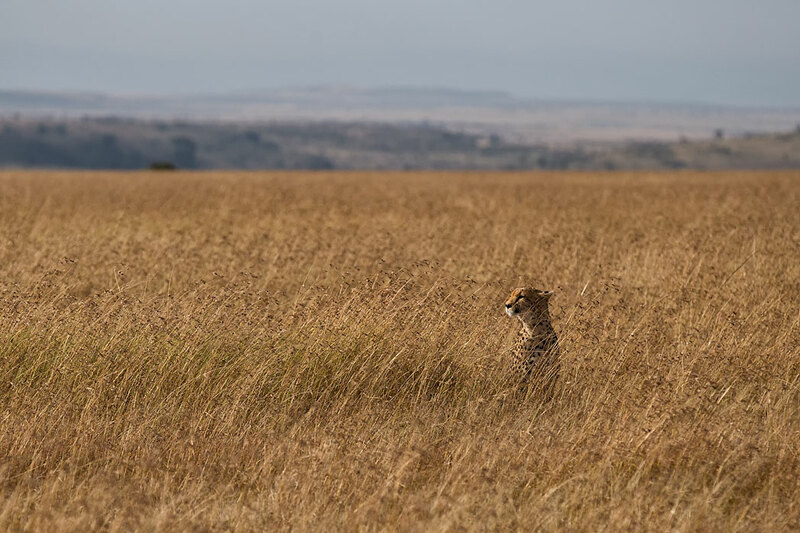 As we drive on to areas where the grass is significantly taller, we must use all our senses to spot animals hiding in the grass. Soon we see a vulture begin to circle the area. 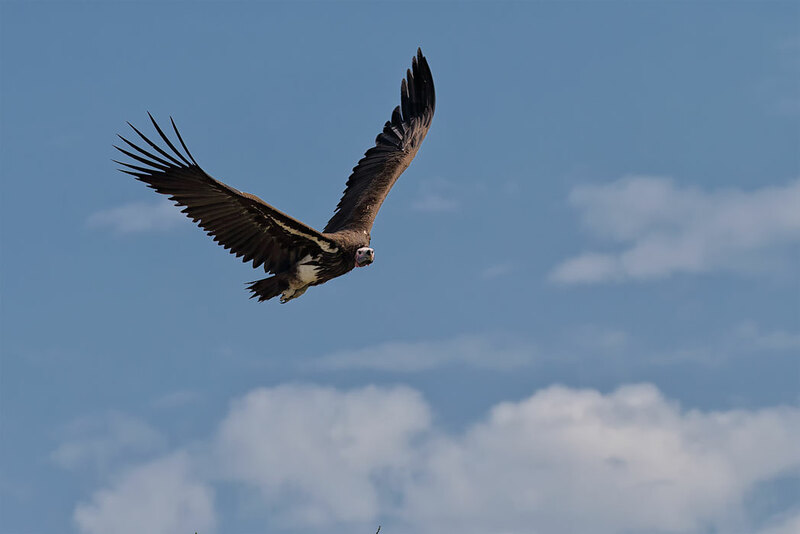 Vultures are in huge numbers all over Kenya and Tanzania and perform an important role in the circle of life. But seeing a high circling single likely means that an animal has made a fresh kill in the area-otherwise hordes of vultures would be around. 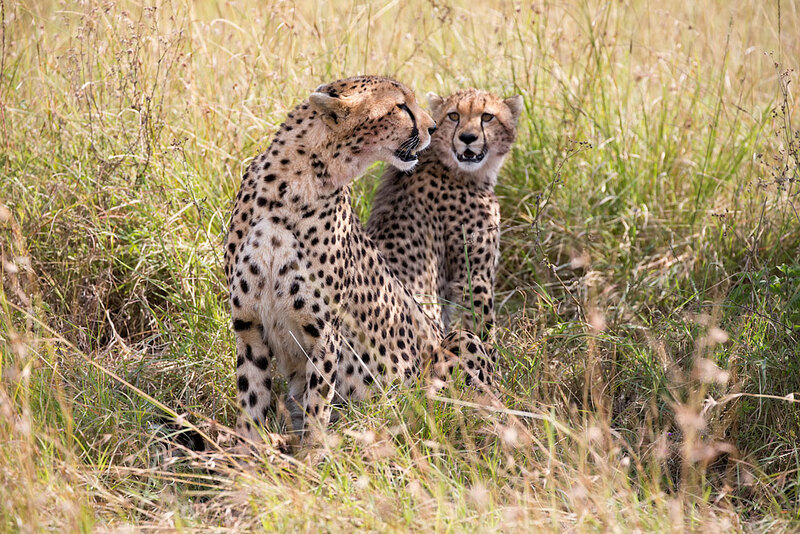 Soon we were rewarded with another cheetah sighting when the cheetah, with fresh blood on its face, abruptly raised its head. The cheetah looked around with concern that vultures or something else would steal its kill. 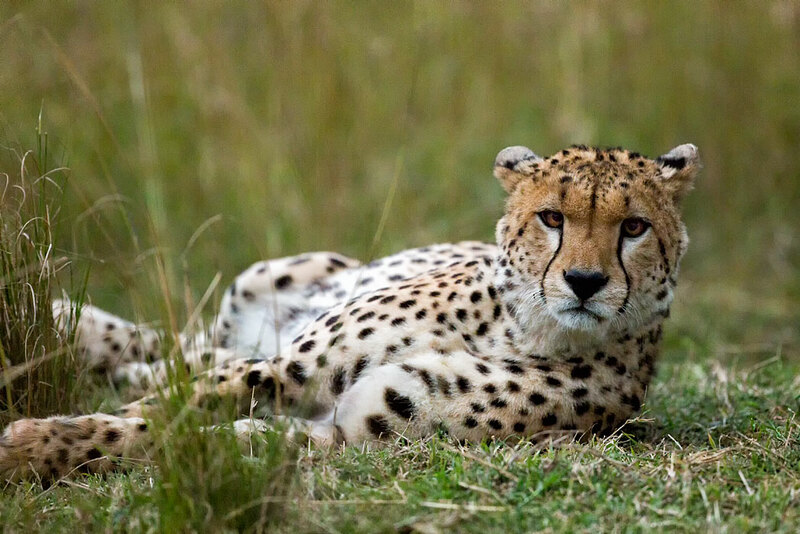 You see Cheetahs are fairly fragile. They are sprinters and skilled hunters but the rest of the animals know they are over-matched when any of a number of animals on the ground or in the air decide to take their kill. By now the shadows are beginning to shorten-telling us that the “cats” are likely huddling in the shade. As we scan the taller grasses with our binoculars, we pause a moment at each small tree or shrub knowing that something might be resting under them. 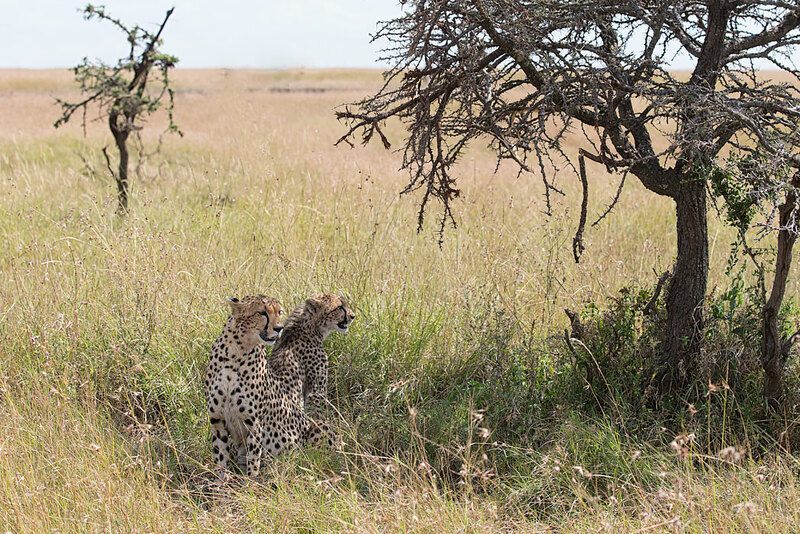 Moments later we are rewarded by not one but two cheetahs lounging in the shade. As we move closer, we can see that one of the cheetahs is still a cub with its ‘mullet” mane that would have made Billy Joe Cyrus proud. While still considered a cub, it was some months older than the lions cubs that began our day. 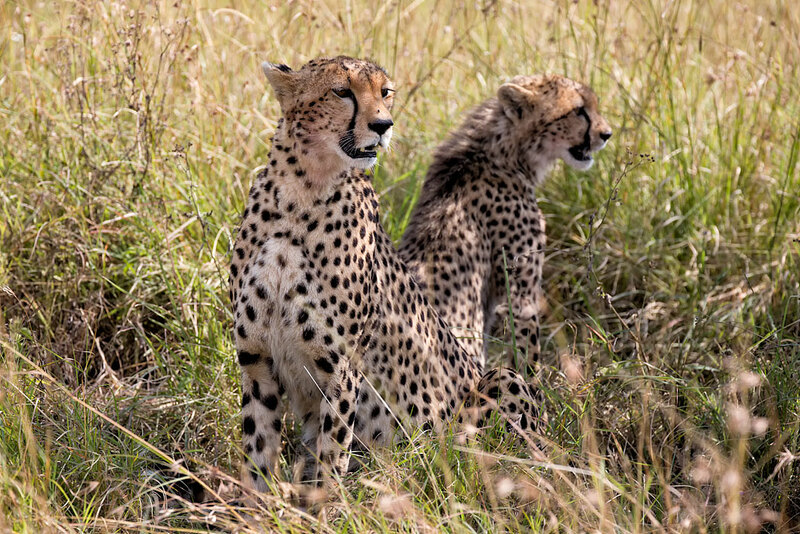 Little did we know how much entertainment these two cheetahs would provide us in the days ahead. Since there was no threat, it was clear they were going to be sedentary for a while. We decide to move on towards camp for lunch. Normally, we would spend the full day out in the bush, but the rumblings of thunder, while still in the distance, suggested that now a camp lunch would be prudent. Buoyed by the morning sightings but cautious of the rumbling thunder that now is closer, we take off with the resolve that we will come in at the first sign that we will get wet. Our goal is to complete the grand slam of big cats in a single day-so we are off to find a leopard hopefully with cubs. The sky is darkening quickly but the rain is badly needed as animals are reduced to drinking from small puddles which often are no more than mud holes. 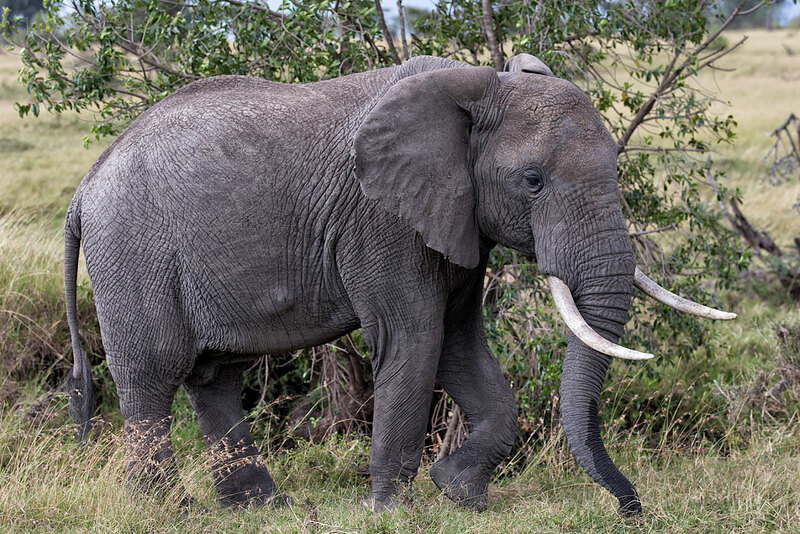 Elephants will often push down through the mud and sand to find water underneath. All part of survival during the dry season. As we move on, we can see that the cooler temperatures are making the animals more active. But the declining light will no doubt make taking images much more difficult. We head down a muddy and slick dirt road. 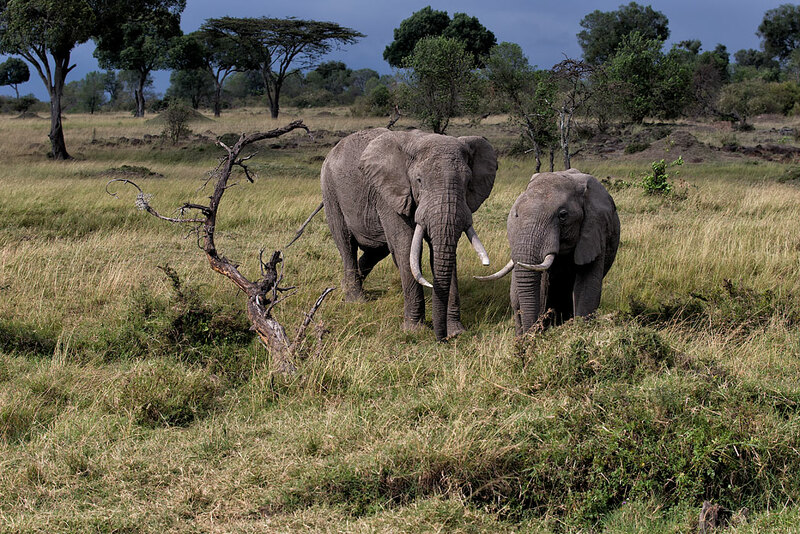 There are many animals grazing in taller but thinner grass than we had seen before. 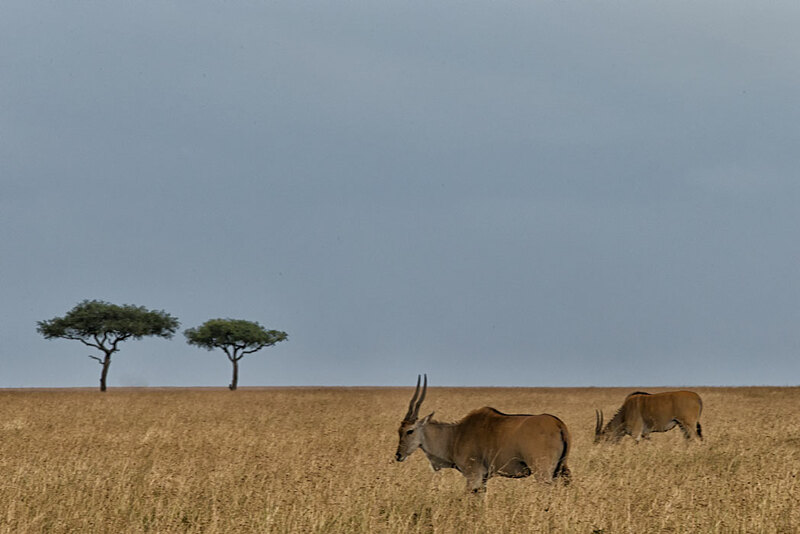 First we come upon some Elands that heretofore had seemed quite shy. As we continue on, we see a large herd of zebras grazing. 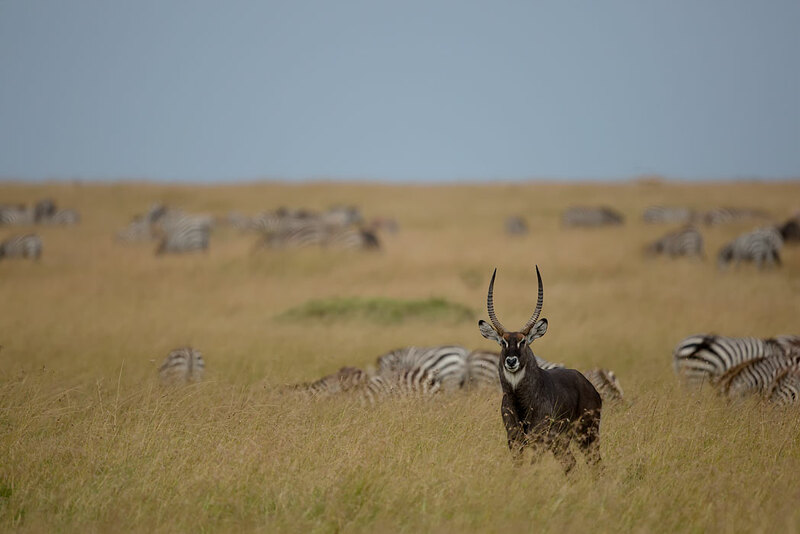 Always alert, a male water buck watches as we make our way by. We continue to drive and notice that the animals seem much more attentive now. While they are enjoying grazing on the taller grass, they know that the cooler temperatures will make the “cats” more active. At least that was what we felt until we came across even another cheetah who clearly was not ready to hunt at the moment. The glaring stare and focus reminds us of what master predators these cats can be. This cheetah seems to be the one we saw earlier in the day. It was the one that was quickly gorging itself on a morning kill-while hoping the “bullies” such as hyenas stayed away. Moving on, we could see the showers were becoming more widespread but hopefully moving away from the small woodland that we hoped held the leopard. We had driven some distance and now were well pass the point of quick return. So we entered the woodland, scanning the treetops and bushes in hopes of sighting the leopard. As we bumped along, the rain showers we had avoided for so long had now caught us-and proceeded to dump buckets of rain water on our heads. Good news is that we had closed the side curtains and rooftop in a nick of time. The bad news is that the dirt roads (that are really just paths) became as slick as hot butter. Even with four wheel drive, the Landrover would want to slide on the rutted trails. We decided to call it a day as the light was very poor now and the day had already been so incredible. But nature was not finished with us. Suddenly, the Landrover slid sideways a few feet and then we were stuck-in a warthog mud hole no less! Now the rain was pouring down and the thick clouds made it look even darker. Must admit that I did think for a moment what spending the night out in a land full of things that might eat us would be like. But no worries, Dominick and Dennis rapidly pulled an assortment of jacks, shovels and more. With the aid of some readily available rocks, we were soon on our way. But not before a hyena came and watched curiously. For Dominick and Dennis this all seemed routine. For my wife and I, we were deep into our contingency planning just in case the hyenas and others hungrily descended on us. Heading back to camp was an adventure on the dusty roads now turned into mud-slicks. Reminded me of my days as a child at the carnival riding the famous “wild mouse”. Spinning and sliding, it never occured to me to qet nervous. But I am speaking only for myself! 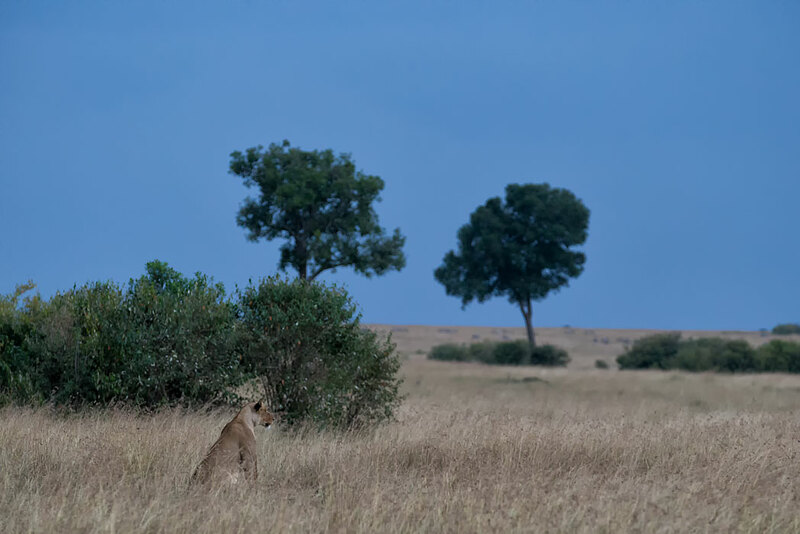 Ever confident in Dennis’s expert driving, we were near camp when we came upon a pride of lions. 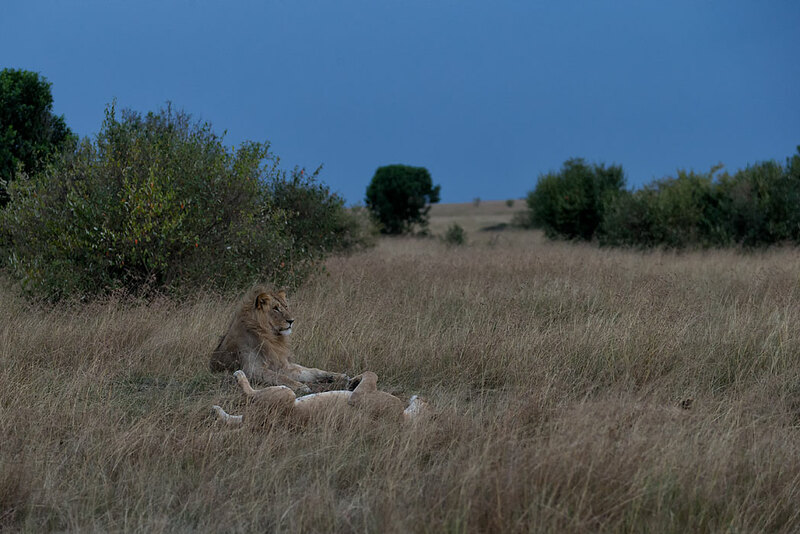 They were lounging in the grass no doubt waiting for an active night of predation. We paused and took a few images to test the low light, High ISO capability of our cameras. In a moment, we watched a young lioness focus on some warthogs. The focus was intense and she began to stalk. I felt the adrenaline rush as she lowered her shoulders and crept through the tall but thin grass. It was exciting even though the action would likely be to dark to capture with our cameras. I must admit I wondered for a moment if one of the warthogs had made the mud hole that we got stuck in. Seemed like justice. Anyway, the warthogs were down wind and soon they picked up that deadly scent of the killer-and after a short chase, sprinted safely away with their tails standing straight up almost is if taunting the young lioness. As we settled back into our seats, we noticed her older siblings seem to watch her in amusement as the warthogs were clearly much too far away for success. Now it was time for us to celebrate another incredible day in the bush. So we turned on the headlights and headed home. Only thing between us, a shower and another very fine meal back at Ngare Serian was crossing the rain soaked rope bridge in the windy dark, across the rain swollen river that was filled with snarling crocs and hippos to our tent. Well that at least is how I told it to my grandchildren! What an adventure. Stunning pictures. Fascinating synergy between warthogs and the other beasts of the wild. Thanks for sharing….